The Body Shop's Shea Butter Richly Replenishing Shampoo (£6.50 thebodyshop.com) is a new addition to the popular Shea Butter range. It is formulated with Community Trade shea butter from Ghana to deeply nourish the hair... and it does just that. This richly replenishing shampoo leaves hair feeling soft and nourished - no stripping strands of moisture here! It is lovely to use and smells absolutely gorgeous. It gently cleanses hair and rinses away perfectly, without leaving any residue behind. It is also vegan and very affordable, at £6.50 for 250ml! Next up is a shampoo from a new - incredibly stylish - haircare brand, Chämpo. Chämpo - pronounced chat-pour - is a British haircare brand that blends contemporary design and the science of trichology, with acitve botancials and Ayurvedic princibles. Every product is vegan and contains 98% naturally derived ingredients. Chämpo's haircare ranges utilise Ayurveda’s ancient wisdom to precisely treat and restore hair to its natural best. There are three ranges, each named after the three Ayurvedic Dosha types; Vata, Pitta, and Kapha. Chämpo even has an online quiz to help you discover your hair dosha. I completed the quiz, describing my hair as fine and limp, and listing my hair goals as volume and thickness. My hair dosha was Pitta and the shampoo I trialed was the Pitta Volumising Shampoo (£18 champohaircare.com). This shampoo is designed to strengthen and protect the hair from breakage and restore weightless volume. It provides great volume - since using this shampoo my hair has been far more bouncy and manageable. It also feels and looks healthier. 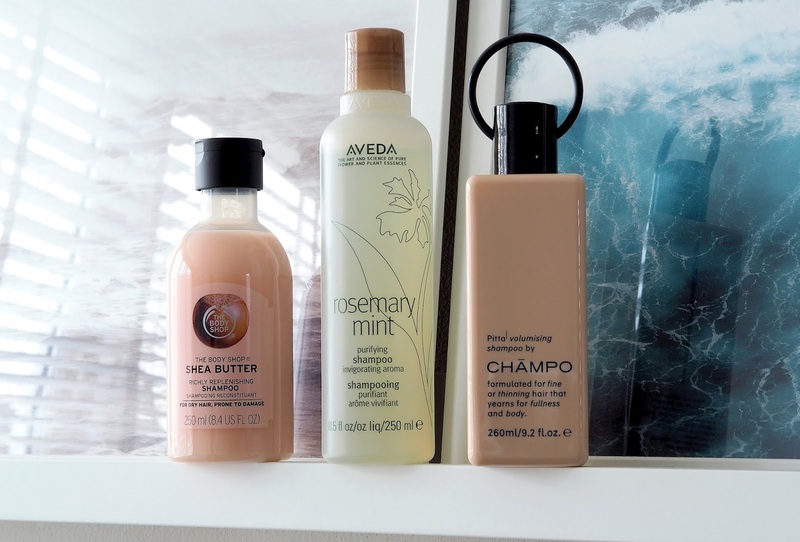 Like The Body Shop's Shea Butter Shampoo, the Pitta Volumising Shampoo gentle cleansing the hair and rinses away easily and completely, leaving nothing nasty behind. It also has a unique scent that leaves hair smelling beautiful throughout the day. Finally we have the Aveda Rosemary Mint Purifying Shampoo (£19 feelunique.com). Now, this product isn't technically new, it's just repackaged. However, it's so good that I had to include it. The formula features cleansing micellar technology, which causes micelles to form when the shampoo is activated with water. These micelles then attract, trap, and remove dirt, excess oil, product build-up, and other impurities.The formula also features white vinegar, helping to purify the hair and - thanks to its low pH level - promote shine. During the distilling process, this white vinegar is first turned into steam using high heat, and then allowed to condense back into liquid form. Doing this destroys many nutrients present in the undistilled vinegar, leaving an ingredient that is almost pure acetic acid - absolutely perfect for clarifying the hair. I love this shampoo. It cleanses my hair perfectly, leaving it soft and super shiny. It is silicone free, vegan, and safe for colour treated hair. Although it can be used on all hair types, it is ideal for oily, fine to medium hair. What The f**k Are Peptides?